The Fullbridge seminars, 10 topics over five days with an array of team presentations sprinkled in, are a “finishing school’’ for undergraduates to prepare them to shift their thinking from a strictly academic perspective to include a professional perspective as well, according to Dr. Janet Haavisto, who oversees the program. Participants are put into four teams at the beginning of the week, have two sessions per day and the final two days are spent analyzing a company each team has picked and finally giving a presentation on the final day. While the program has a business bent to it, non-business majors also benefit. 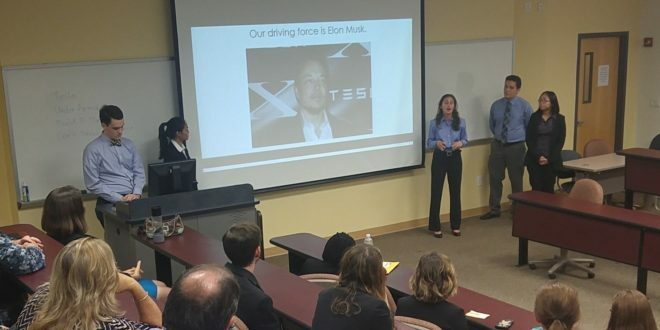 One of those this year was senior Elizabeth Smoller, from Long Island, N.Y., who is a psychology/sociology student and whose team chose to present on Build-A-Bear (Tesla, Under Armour and Craft Brew Alliance were the other companies chosen). Smoller said she initially struggled with accounting aspects of the camp, but, as time went on she adapted. The sessions were coached by Melissa Webster who has a Bachelor of Science degree from Wellesley College and an MBA from the Massachusetts Institute of Technology and extensive management and marketing experience including as Vice President of the Energy Management Group for Skanska. She has logged about 320 hours coaching for Fullbridge, Inc.
On the other end, Webster said the ability to manage a career is a big take away from the program. Participants in addition to Smoller were: Erik Blomgren, Emily Adams, Jared Mickler, Sarah Buckman, Steven Pietrusza, Ben Harden, Charly Adams, Cheyenne Ramirez, Laura Wardrop, Ruth Adeyemi, Bryam Duque, Cindy Leong, Janel Palomo, Landon Harper, Robin Rutkowski, David Abraham, Ian Vargas, Savannah Bates and Shelby Mickler.